The British Motor Industry Heritage Trust, based at the British Motor Museum, is again supporting the Bonhams London to Brighton Veteran Car Run, supported by Hiscox, which is taking place this Sunday, 5 November. Charley Boorman, TV presenter, adventurer and travel writer will drive the Museum's 1904 Rover 8hp which is the oldest surviving Rover car and just one of 6 cars from the Museum's collection which will be participating in this year's Run. Charley is also representing the Movember Foundation. Other cars from the Museum which will be taking part include a 1901 Wolseley 10hp tonneau which will be driven by motoring journalist Quentin Willson. 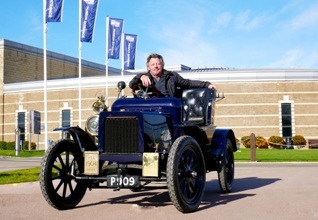 The British Motor Industry Heritage Trust's new chairman, Kevin Timms, will be driving a 1904 Thornycroft 20hp tonneau, which was driven last year by Lindsey Russell from Blue Peter and in 2014 by Olympic legend, Sir Steve Redgrave. Also participating are the Museum's 1899 Wolseley 3½hp voiturette, 1902 Albion A1 dog-cart and 1904 Wolseley 6hp phaeton. The Bonhams London to Brighton Veteran Run supported by Hiscox is a premier event in the annual motoring calendar and has been running longer than any other in the world. It marks the historic day in 1896 when a group of pioneer motorists set out from London towards the seaside, in celebration of the 'emancipation of the motor car'. Stephen Laing, Curator at the British Motor Museum said "We are delighted that Charley is driving one of the cars from the Museum's collection. The Run is one of the most exhilarating and exclusive motoring adventures in the world. These wonderful cars are all more than a century old and are some of the rarest and finest models from our collection. Watching 400 veteran cars take part in the Run is an amazing and nostalgic experience." To find out more about the British Motor Museum please visit the website at http://www.britishmotormuseum.co.uk or call 01926 641188.